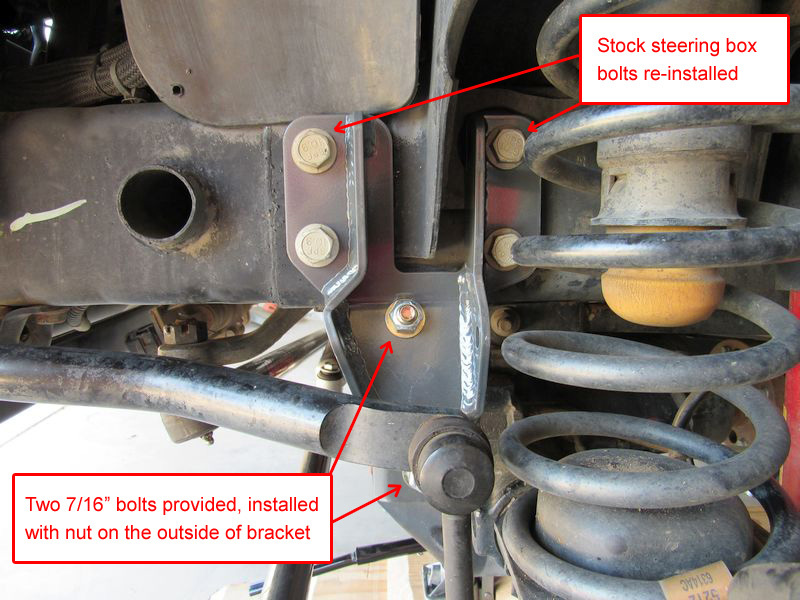 In this post I will attempt to describe a step by step installation of a Synergy Manufacturing Jeep JK front track bar brace. This brace is designed to distribute the increased load the track bar frame side mount encounters on a lifted Jeep or a Jeep with larger size tires. The brace is laser cut and CNC bent from 3/16″ high strength steel. The added track bar bracket thickness prevents the track bar bolt from ovalizing out the stock mount holes, which can lead to vibrations and eventually cause the dreaded death wobble. 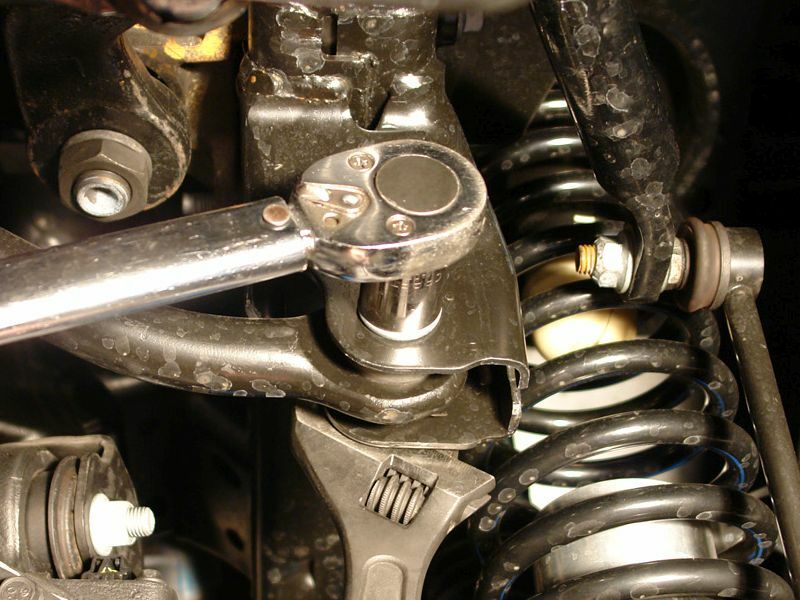 There are multiple reasons causing the “wobble”, like worn ball joints, loose tie rod ends, worn u-joints, loose adjustment collars on tie rod, drag link or track bar, or worn track bar attachment points on either axle or frame side. 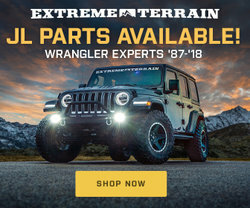 Your track bar keeps the axle centered underneath the Jeep when turning and operates under tremendous forces, and the weak stock mounts on both the axle side and the frame side could potentially begin to fail. The holes in the mount might start to become more oval and cause a bit of a play, resulting in shimmies and wobbles. If you use your Jeep as intended and do wheel it, you might encounter a situation where your wheels are blocked by rocks while you try to turn, and your track bar pushes so hard on the mount that it finally brakes it off the frame. It is an extreme scenario, but I have seen it happen. 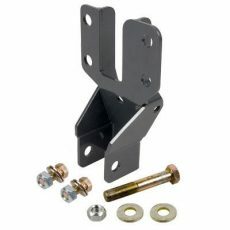 This brace adds strength to the mount and eliminates this weak link in the system. Synergy Manufacturing offers their own installation instructions on their website, which you’re welcome to use for reference. Make sure you are parked on level ground. Place a wheel chock in front of each rear tire. Using a breaker bar or a wrench with a 21mm socket, loosen the track bar bolt in the frame side mount. Use a 22mm box end wrench or an adjustable wrench to hold the nut. 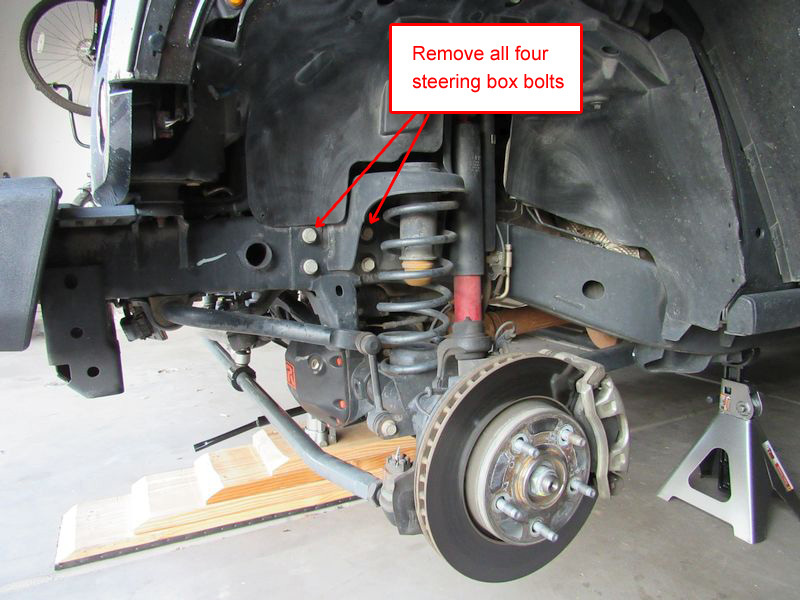 You will have to apply a lot of force if this is the first time you’re removing the bolt, so it’s better if you do it with your Jeep still on the ground. Loosen all lug nuts in both front wheels. Position your scissor jack or bottle jack right under the center of the front axle, just to the left of differential. To get more lift, place three or four pieces of a 2X8 lumber under your jack. Each piece will give you an extra 1.5″, but make sure they are stable. In my case I used one of my DIY ramps made out of 2X10 lumber. 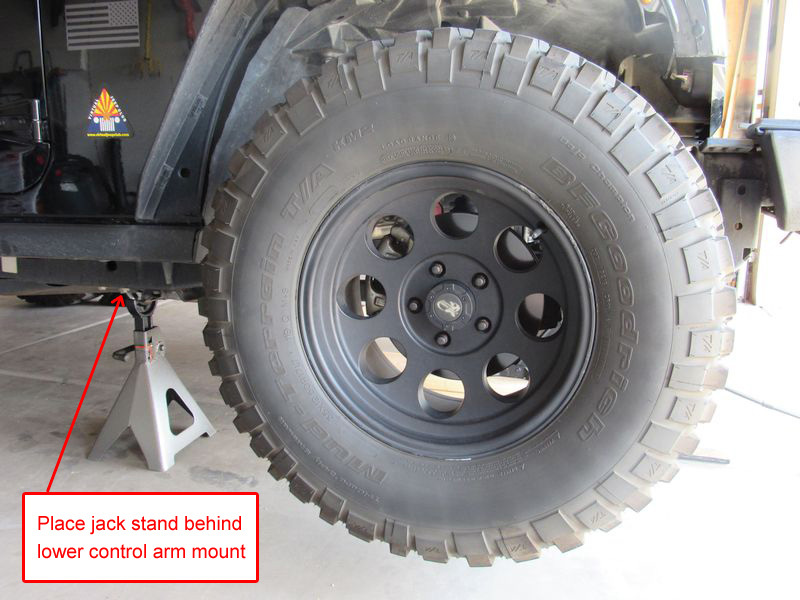 Lift the axle high enough to be able to slide the two jack stands under the frame. 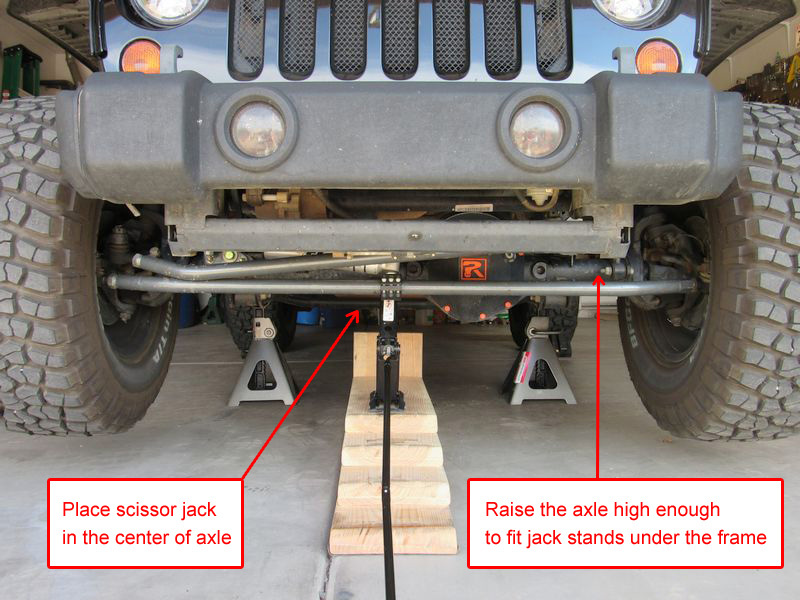 Place each jack stand under the frame just behind the lower control arm mounts, make sure the frame will be resting correctly on stands. 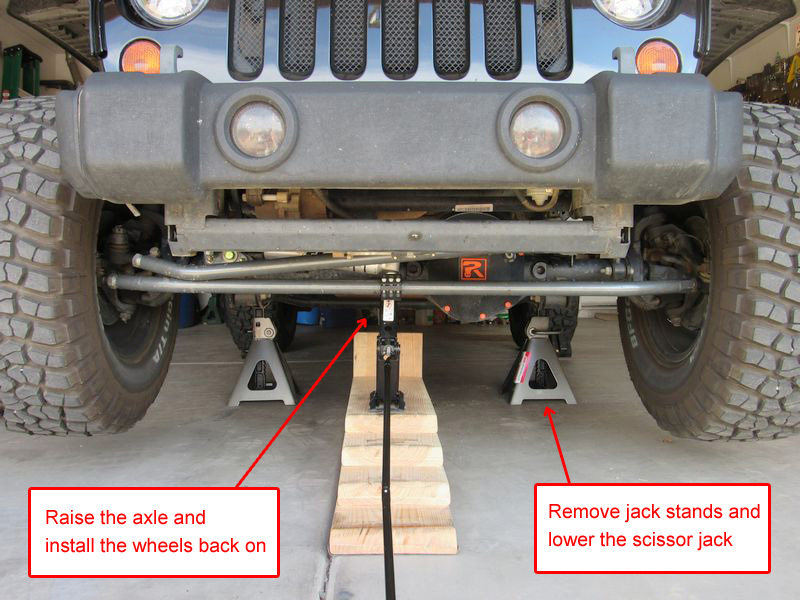 Lower the scissor jack to allow the frame to rest on jack stands. Make sure it is secure. Take both front wheels off and move them out of the way. By removing both front wheels the axle stays level. Remove the track bar bolt completely, pull the track bar from the frame side mount and let it rest. Keep lowering the scissor jack to allow the axle to drop, the springs to expand and the sway bar link to move below the level of the track bar mount. It will allow you to remove the four steering box bolts and make it easier to place your new brace over the mount. Remove all four steering box bolts. Reach under the steering box and support it as the last bolt is being removed. I would suggest that you support it with a bottle/scissor jack and a piece of wood (you want to make sure the steering box remains in its place). 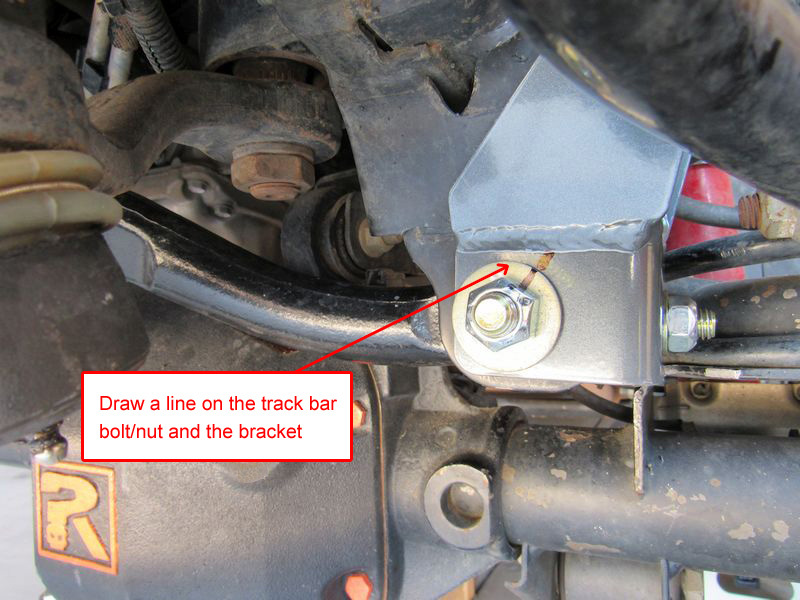 Install the track bar brace by fitting it over the factory track bar mount and installing the 9/16-12 UNC track bar bolt provided in the kit. Do not install the nut. The bolt is just to hold the bracket in place for the time being. The holes for the track bar bolt in the mount and your new brace might not line up right away, which was the case for me. Thick factory welds prevented the brace from fitting nicely. My solution was to install the two 7/16″ bolts provided, with washers under both the bolt and under the nut, at this time, to push the brace firmly onto the mount. Note, these two bolts need to be installed with nut on the outside of the bracket to clear your track bar. I also installed the 4 steering box bolts partially, just enough to make sure that all holes for the track bar bolt line up perfectly, allowing me to easily fit the bolt. If your factory welds on the stock mount are thinner, your new brace might fit easily over the mount, but you might encounter an opposite scenario to mine. The brace might not line up for the track bar bolt because it went past the mount holes. In that case place an extra washer on the bottom 7/16″ bolt, between the stock mount and the brace, and see if that helps all holes for the track bar bolt line up. You might have to add another one or do that for both bolts to make sure everything lines up perfectly. Install the track bar back into the mount and push the bolt with washer through. Install the nut with washer and hand tighten it. Torque the 4 steering box bolts to 70 ft-lbs. Torque the two 7/16” bolts to 50 ft-lbs. Lastly, torque the track bar bolt to 125 ft-lbs. Using a permanent marker, draw a line on the track bar bolt or nut and the brace, to check after driving for a while if everything remains tight and the bolt did not loosen. 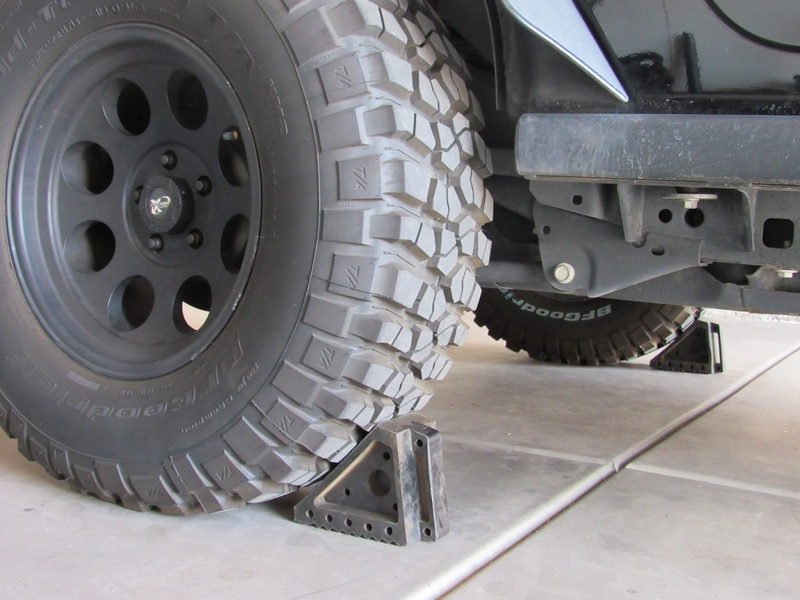 Using your scissor jack, lift the axle back up high enough to be able to install both front wheels and tighten all lug nuts, but not all the way. 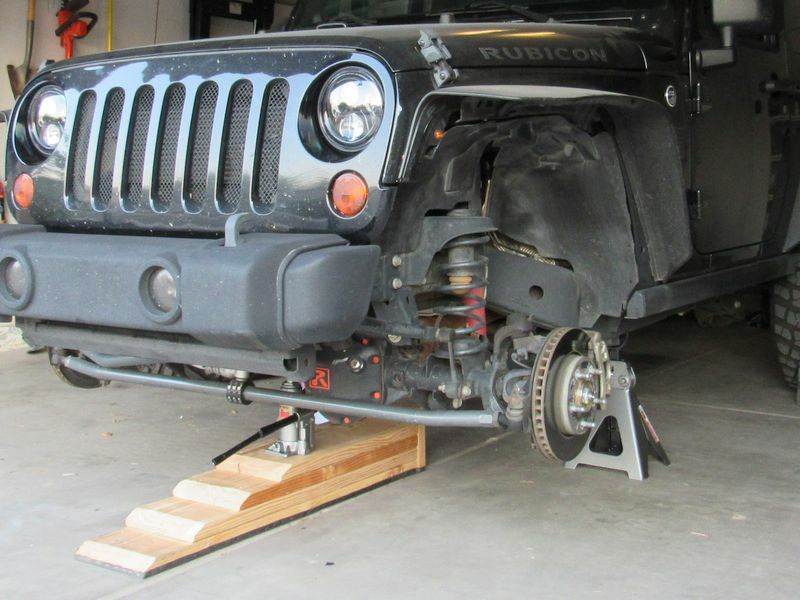 Continue lifting the axle until you raise the frame above the jack stands. Remove both jack stands. Slowly lower the scissor jack until your Jeep rests on its wheels. Tighten lug nuts all the way with the vehicle firmly on the ground. Enjoy your new beefy track bar brace. Periodically check and make sure that all the bolts in your steering system are tight. You might want to inspect all of the joints once in a while too, and replace if necessary.